Welcome to the homepage of the O.H.R.RPG.C.E., which stands for Official Hamster Republic Role Playing Game Construction Engine. 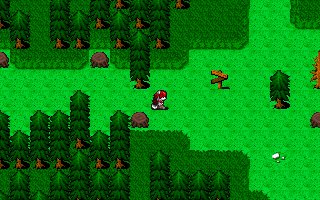 The OHRRPGCE is a free open-source, cross-platform (Windows, Mac, GNU/Linux, Android), and easy-to-use utility with which you can create your own 2D RPG game in a style similar to the classic Final Fantasy games on the NES, SNES and GBA which have so shaped the RPG genre. No programming is required to create a game, though there is a scripting language for customising the engine which has been used to create many non-RPG games. If you are a new to the OHRRPGCE, start by reading the HOWTO, or you can jump straight to the downloads. Originally released over 18 years ago, the OHRRPGCE is still an active work-in-progress. Please check out the list of Known Bugs - you can also give feedback on bugs and suggested enhancements. If you spot a bug that is not on the bug list, read How do I report a bug? and please tell us about it. Also, we need assistance confirming reported bugs and making test-cases for difficult to reproduce bugs. Any assistance you provide can help make the next update that much better. And remember; a good bug-report provides as much information as possible. You will never hurt our feelings by giving us too much info. Who is responsible for this madness? It was started by James Paige, but Brian Fisher is also guilty of aiding and abetting. Ever since the source code was released under the GPL license the OHRRPGCE has been maintained by a team of developers, including TMC, Mike, Simon, Yuriy, Jay, NeoTA, Inferior Minion, Fenrir Lunaris (add your name here if you helped too). Of course, the whole of the OHRRPGCE community cannot be held blameless, seeing as they test features, find bugs, provide suggestions, create games, and in general encourage the developers to cause more trouble. Why did you pick an acronym that is so hard to pronounce? This page was last modified on 9 April 2016, at 02:40.